In the late 1970’s I had heard musical friends talking about a guitarist that seemed to combine rock, classical and jazz music forms into a coherent style all his own. The music had great power but also elegance and clarity of vision. At the time I was listening to a lot of Steely Dan. It seemed like a jazz influence might be the next logical progression. The next step in the evolution of rock and popular music. I heard a few tracks. At that time I was buried in a very physically and mentally challenging point of my life…running an import business. Music had taken a backseat to the everyday grind. 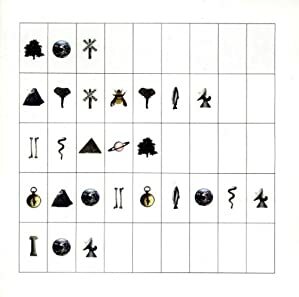 The music of Pat Metheny was lost in my daily shuffle to succeed. Many years later…late 1980’s…I’m driving my son to football practise in my car listening to 101.9..CD101… the smooth jazz station and I am drawn into a piece of interesting music…it has an insistent piano riff pushing a flute melody. The percussion is sophisticated, with a definite Latin tinge…the bass is strong but it must be a standup because the electric snap is very subdued. The melody rides over the backing with an almost magical other-worldy feel borne of a marriage of jazz fusion and Brazilian pop. Who is that? What is that? I like it. I like it a lot! Suddenly a human voice joins the fray singing the melody but in note and sound only…no words are sung…! And then smooth and agile jazz guitar stylings begin dancing in clean scales upon my ears. There is is an unmistakeable feeling of classic jazz improv…and yet the keyboards, drums and horn was make it something more “modern, something fresh and interesting.Finally after what seems like an eternity of pointless jazz-pop the DJ informs me it’s The Pat Metheny Group…a collection entitled “Letter From Home” and the track is called “Have You Heard”. Wow…no I have not heard and I feel like I have missed something of great importance. A few years have passed and I am now fully immersed in the music of both The Pat Metheny Group and his various other musical experiments and journeys. With each collection of pieces I find something new, some greater discovery, some different way to see the world through his musical invention. My favorite albums are STILL LIFE (TALKING) the aforementioned LETTER FROM HOME, BRIGHT SIZE LIFE (introduced to my by my then 15 year old son) SECRET STORY and WATERCOLORS. keyboardist extraordinaire and longtime Metheny collaborator Lyle Mays. The show is a dazzling display of melody, improvisation and virtuoso performances rivaling anything I have ever seen or heard. I took great pleasure in introducing several musician friends to Metheny that night. People who had heard of him but had never heard him. What a great night of incredible music! computer controlled mini-orchestra that is capable of responding to his touch on the guitar. The sounds were soaring flights through some of the most complex and beautiful music Pat Metheny has ever created. It is remarkable how this musical genius continues to grow, develop, evolve and delight with a universe of musical innovation. 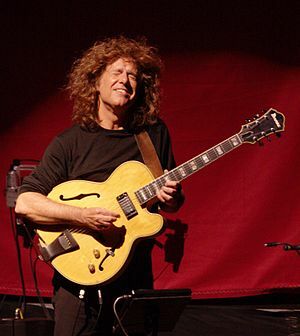 In 2013 Pat Metheny is voted #1 jazz guitarist by the reader of JAZZ Times Magazine. The Unity Band wins Contemporary/Electric Group; They also walk off with Best New Release of 2012; and Ben Williams wins Best New Artist. Wow. 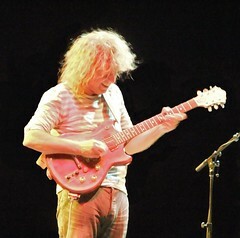 The Downbeat Readers Poll names Pat Metheny as 2012 Guitarist of The Year. he continues to soar ever higher in a career filled with inspiration and achievement. And now Metheny stands poised for yet another groundbreaking moment. His collaboration with John Zorn released in May has people talking. It has a lot of them scratching their heads as well. In what has been described as Metheny’s “mind-meld” with John Zorn, the two have fused a real collision of style, approach, sensibility, and genre. Does it work? What does it all mean? Metheny is taking us somewhere new if we let him. I’d suggest we let him do just that. This entry was posted in Music, Pop culture and tagged Beacon Theatre, Ben Williams, John Zorn, Letter From Home, Lyle Mays, Pat Metheny, Pat Metheny Group, Unity Band. Bookmark the permalink. One of my favorite albums…thanks for your words and reminder of what fine music it is! 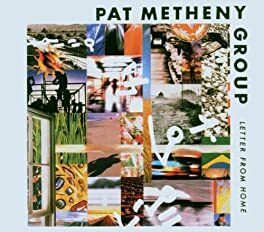 I am a huge Pat Metheny fan to this day! I remeber you were at that show at the Beacon! CD 101.9 highlighted some great artists. Like you say it was a nice change/diversion from classic rock, sports talk and politics. Like everything else in this capitalist society I guess it wasn’t profitable enough to continue. Why does everything have to be pre-packaged to fit what the marketing people think we want ? To make the maximum amount of $$$$! It’s the music BUSINESS!